Well who was this fellow? I learned that Bob Sheffey was a preacher who was well respected by the people of the mountains from Wytheville to Pearisburg to Bluefield, to Richlands, Virginia, and in several places beyond and in between. He was born in 1820 near Wytheville in the town of Ivanhoe. He died in 1902 in Staffordsville, Giles County, Virginia, in the little community of Trigg. In between his birth and death, he had a very interesting life, one that is not without controversy to this day. The quick version of his biography includes the facts that his mother died when he was two and he was raised by an aunt in a fine home in Abingdon, Virginia. The religious training there was very formal. They frowned upon the more emotional expressions of the Methodists of that day. Yet Robert found the gospel interesting and came under the convicting power of the Holy Ghost in a revival meeting held over a store in that town by a circuit riding preacher while still a young man. He was smitten with God’s love and power and soon gave his heart and life to God, becoming a recipient of Justifying grace at an altar of prayer. Brother Sheffey’s lamb skin prayer rug. 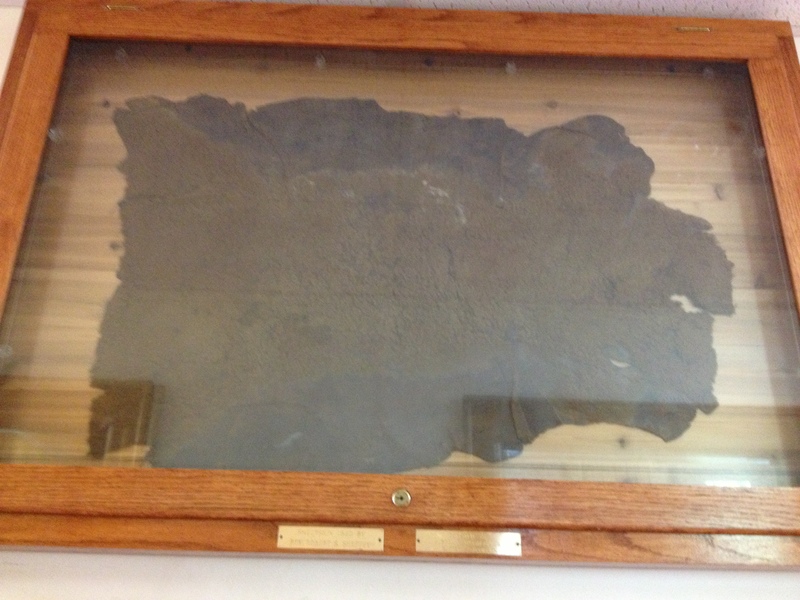 It was donated by Suiter and Joe Davidson to the Bluefield First United Methodist Church in Bluefield, Virginia, where it hangs in a place of honor. He argued with his aunt who was not pleased with his sudden emotional conversion, and they parted ways, yet when he heard of her impending death, he returned to Abingdon only to be confronted with the fact that she had died and her dying orders were that a lamb skin would be given Robert as a sign of her love and forgiveness and acceptance of his faith. He carried that lamb skin everywhere he went, often getting off his horse to kneel in prayer on it, and spending much time praying to his “Sweet Lord Jesus,” and making a difference in the communities where he traveled. 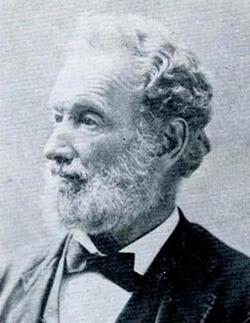 He tried to become part of the Methodist conference (Holston) only to be refused, and he didn’t try anymore, but as his fame spread, Holston came to accept him as a “local elder” of the church. He was only under appointment officially for a few years before commencing his own independent circuit. He prayed for people to come to faith, prayed against the evils of alcohol (causing moonshine stills to disappear by the power of prayer-I’ll leave those details up to your further research), and he prayed for simple things like the need for the bees to swarm, or for well-diggers to find water. 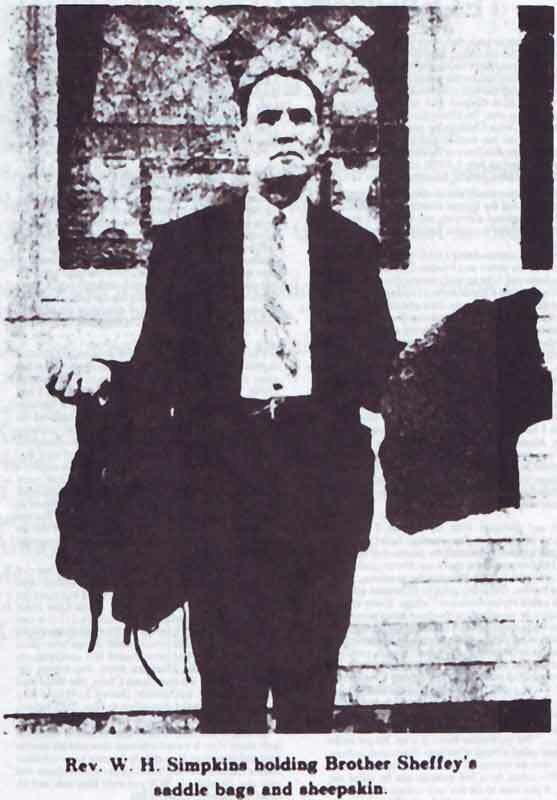 His major project later in life was advocating for the continuation of a camp meeting at Wabash, a little community south of Staffordsville, where people had held meetings for many years. The modernization of the church was a bothersome thing to the preacher, and he grieved the passing of such things as camp meetings. A fire destroyed the meeting grounds before Sheffey died, and he wanted to rebuild it but never found the resources or will of the people to do so. He was buried in a little cemetery at Trigg near the Wesley Chapel Methodist Church. A memorial camp meeting is held on grounds near his burial site each year, and descendants gather one day of that meeting to reconnect. The controversy of Sheffey’s life includes a rather vocal discontent with the way he treated his family. The folks in Staffordsville today can report that his wife’s family (his second wife was a Stafford) had to help keep his family up while Sheffey was on his long excursions around the area, where he would stay gone months at a time. A blogger has captured some of that at this link. Regardless of his family life, he was a devoted man of prayer. And most stories that circulated (and were collected around thirty years after Sheffey’s death by Willard Sanders Barbery) tell of the power of his prayers that seemed to get complete and powerful answers. It was common for Preacher Sheffey to come to the camp meetings and go off into the woods to pray on his sheepskin until he felt the meeting was going to break open. My uncle, J. W. Perry was preaching one night at Wabash and Preacher Sheffey returned to the camp shed about the time he wound it up. Uncle John went to his tent to rest while the “mourners” prayed at the shed. Preacher Sheffey joined them praying and exhorting others to come forward. It is reported that on that very night many in the crowd report they heard the angels singing above them, although some doubted. But many came to faith that night because of the praying parson. Sheffey’s life has been written about in W. S. Barbery’s book “The Life and Times of Robert S Sheffey” and in Jesse Carr’s Historical Novel “Saint of the Wilderness,” upon which a movie was based in the 1970s called “Sheffey” and produced by a film company in conjunction with Bob Jones University. The life of this man continues to be a source of inspiration to people today. We need to believe and pray like Brother Sheffey. This entry was posted in Uncategorized and tagged camp meeting, conversion, convicting power, family, fire, God, Holston, holy ghost, justifying grace, kneel, knelt, lamb skin, Methodism, pray, prayer, prayer rug, praying, preach, preaching, Robert Sheffey, sheep skin, Stafford, Virginia, Wolf Creek. Bookmark the permalink. 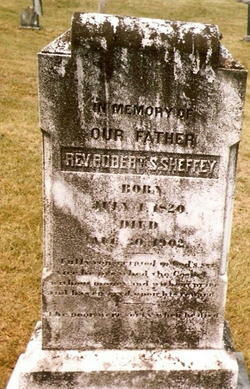 I am interested in any resources you know about regarding Robert Sheffey. I am working on writing a missionary story about him for a VBS next year. He was local to the area I live in. Best sources are Willard Sanders Barbary’s book, and Jess Carr’s Book. Barbary collected stories a couple decades after Sheffey’s death. Carr researched and put together a more literate account, upon which the movie “Sheffey” was based. It’s good to read Carr’s after reading Barbary’s. I think the Campmeeting association in Staffordsville still handles sales of Barbary’s book reprints. Carr’s book is still available in some book stores. Both are available through online sales. Try Amazon. I just finished watching the story about Reverend Sheffey on WVCY, Channel 30 from Milwaukee, WI.,. This is the first time hear of him and his life. I thought it was a wonderful movie and I was inspired and moved by this show.